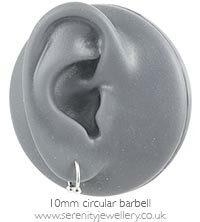 Hypoallergenic titanium circular barbells with 8mm or 10mm internal diameter. The barbells are secured at each end by 3mm screw-on balls. I love it, it is very nice, cute and I like the color, purple, I'm very happy with this purchase. Hi just what a needed titanium to the rescue..tooan allergy to the steel took a while to realise !! I loved the titanium silver colour I was not sold on the rainbow colour after getting it but perhaps more for hip customers or younger ones. Once again brilliant service, items arrived promptly. I bought the rainbow barbell, and it looks lovely. Easy to get in, too. I have ordered good few piercings from serenity, I'm so happy to write a review... 100% and very good on delivery. Love this, looks great in my helix! I went for the pink one! Brought for cartridge ear piercing. Sits perfectly. These earrings did the job of 1) not aggravating the piercings and 2) not poking and jabbing me while I'm sleeping, but they're so tiny that I have to get help to put them in, namely the screwing-on of the ball at the end. Even with help and a bright light, it can take several minutes just to get one secured. These would look lovely but they're quite thick and I can't get them through my piercings. Also, the balls are tiny and incredibly fiddly to screw on, even when the earrings are not in.